This is the Carzone.ie guide to buying a used VW Tiguan. The original Volkswagen Tiguan, built from 2009 to 2016, was a rounded-off shape and emblematic of the previous generation of Volkswagen’s smoother styling. So, when it came time to replace it for the second-generation, the Tiguan became much more angular – and it made the car far more desirable. An upmarket SUV, the Tiguan operates in a zone between the C-segment class and the full premium models. The earliest, used 162-plate examples of the Tiguan Mk2 are now filtering onto the used market and, if you buy cannily, you can be driving around in Volkswagen’s stylish SUV for a big reduction compared to its new price. 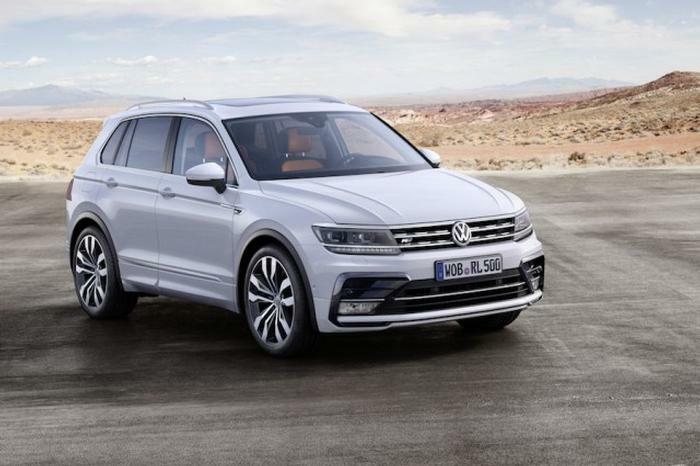 Volkswagen offered the Tiguan from launch with a choice of a 1.4-litre TSI turbocharged petrol or 2.0-litre TDI turbodiesel engines, all with four cylinders. Power ranges from 125hp on the lower-spec 1.4 TSI up to 240hp with the twin-turbo TDI range-topper. Lower-output versions are equipped with a six-speed manual and front-wheel drive, with only models with 150hp or more offered with 4Motion all-wheel drive (either as an option or standard) and seven-speed dual-clutch or eight-speed automatic transmissions (again, either optional or standard fit). Volkswagen Ireland has sold the car since launch in familiar Trendline, Comfortline and then Highline specifications, with even base cars gaining 17-inch alloys, Halogen headlights and LED taillamps, and a leather steering wheel. Most people ordered 2.0 TDI versions with 150hp in Comfortline spec, which gained a 6.5-inch Composition Media infotainment system, front fog lights with a cornering function, adaptive cruise control, Park Pilot, a multifunction steering wheel, rear privacy glass and a different design of 17-inch wheels – these are the ones to seek out on the used market. Flagship Highline models come with 18-inch alloy wheels, LED headlights with Dynamic Range Adjustment, heated front seats, Hill Descent Control and Park Assist with a rear-view camera. The regular Tiguan is a five-seat SUV and, in 2017, the line-up was expanded with a long-wheelbase version called the Tiguan Allspace, which offers seven-seat capability. It is sold with much the same engine and trim options as the five-seat Tiguan. As mentioned above, a Comfortline 2.0 TDI 150 will be a fine conveyance, offering a premium ownership experience at a more reasonable cost than some of the higher-power and more extravagantly equipped models of Tiguan. The Volkswagen Tiguan Mk2 moved significantly upmarket when it launched in 2016 and, while it looks expensive compared to five-seat SUVs from sub-premium manufacturers, compared to Audi, BMW, Mercedes and Volvo competitors it’s actually quite keenly priced. Volkswagen’s prestige status means take-up of the Mk2 Tiguan was strong in Ireland from the start, so there are plenty of used examples available for considerably less than €30,000 – a huge reduction on the asking prices for new models that sit in Volkswagen showrooms.